I Skate, Therefore I Am: Praise the Board! 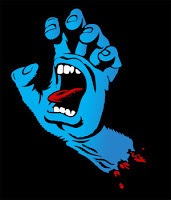 When I was 20, I would stare for hours at the Jim Phillips' iconic blue Screaming Hand. I though that kind of art would only come from the mind of a tortured man. I did not know I would sight at what would become an icon of the skate culture along with popping eyeballs, spurting arteries, winged wheels, skulls, calaveras & bones… Like the building blocks of skateboard imagery, all those artistical creations have created a fantasy empire: in 2007, the screaming hand had been poured into vinyl and the toy, which celebrated Phillips's 45th anniversary as an illustrator of rock posters, surfboards, and skateboard decks, was on sale for only $150. Who wants a $150 plastic toy when, now, you can see the original at the "Santa Cruz Design + Innovation Center". Eight years old skateboarders do not know the history of the wheel bearing, when after a couple of turns, balls would escape from their craddle, they may not even have heard of the progression of skateboarding and about some exceptional and catastrophic events like the drought that drained California swimming pools which in turn where flooded by the amazing Z-Boys leading, 30 years after to the X-Games Xtravaganza. Would they know that, initially, slalom was a paramount discipline and that only the best skaters would do it? And that there is a revival of slalom and downhill racing? Why is it that Santa Cruz, and not Dogtown, would be the crate of skateboard grey matter? Granted, Wes Humpston and Jim Muir marketed the first successful line of boards with graphics under the Dogtown label. They were the first ones to have a design under the board, but it is Santa Cruz skateboards that cashed on creative and outrageous designs to sell their boards and crossed-over to millions of fans. That is maybe because when skateboarding started, it was mostly associated with psychedelic rock culture and the reign of bands like Jefferson Starship and the Grateful Dead and that when that form of music somehow evolved into punk-rock, design also became punk-rock. Anyhow, I have not seen the exhibit, but I guess that, apart from Jim Philips, the show will include art from Johnny Mojo, Nathan Carrico, Kevin Marburg, Demetrie Tyler, Tosh Woods and many more. The art and creativity of the Santa Cruz artists have played a key role in shaping the skateboard imaginary whose defining characteristic seems to be its constant thrashing of good taste at the frontier of the 1st amendment. When you talk about limits, Santa Cruz has always been Close To The Edge, Yes! Like a Mavericks. In the 70s, Skateboarder presciently declared that “The sky is the limit”. Skateboarder was wrong, they had horizontal vision: the vertical wall of an art exhibit is skateboard's limit! 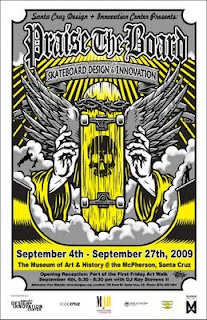 The Museum of Art & History @ the McPherson Center presents: Praise the Board: 35 years of Skateboard Design + Innovation Organized by the Santa Cruz Design + Innovation Center. Location:: The Museum of Art & History, 705 Front Street, Santa Cruz, CA 95060. Go see it!